Size of the compressor: 13" x 5.5" x 8"
Complete your project or work in time with the powerful DA400R airbrush compressor. You can use this item for any hobby like painting, graphics, tanning or illustration. If you want to achieve good results in your work, take a look at this device, as it fastens the process and grants even spraying. Moreover, this high-quality equipment can help you to get the most out of your airbrush. The DA400R model suits not only for professional but also for hobby artists. The assembly of the air compressor is quite simple, however, you can always use the instruction manual attached to the product. And finally, the DA400R compressor matches an airbrush you use as well as it reduces energy consumption and cuts down on expenses. This model is a perfect solution for any type of airbrush because its operating pressure may vary from 0 to 50 PSI adjusting to the airbrush needs. Thus, no matter what airbrush you choose, the compressor will deliver consistent spraying for quality results. This compressor will pleasantly surprise you with simple usage and exciting work quality while delivering steady airflow along with consistent air pressure that results in uniform paint application without sputtering. The DA400R compressor also suits for home applications thanks to its quietness that doesn’t disturb the user during work. Another feature of the item is its portability. The unit is lightweight and has relatively small size what is useful for traveling. For more comfortable and convenient transportation there are two handles with rubber coat. 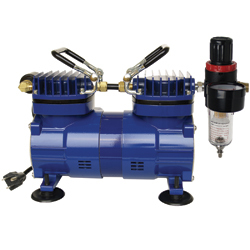 Furthermore, the compressor is equipped with the regulator, moisture trap, and the auto shutoff feature. The moisture trap prevents excess condensation while the regulator lets the motor keep working at a constant pressure level. The auto shutoff function activates when you don’t use the airbrush what decreases energy inputs. Besides, the DA400R airbrush compressor has got a protector which role is to avoid overheat of the motor. In summary, all these components eliminate the risk of damage to the device due to unwanted humidity and a thermal overload, thus, increasing the working capacity of the compressor. Note. Please, read the user manual before using the device!